I’m standing in my kitchen simultaneously making coffee, soothing a whining toddler, toasting waffles and scrolling through facebook as moms are wont to do at 7am on their day off from work, when suddenly, the sound of things breaking, cats fighting and waffles popping fades into the background. The ball of fire explodes with a whoosh on my facebook feed and before me appears this new marvel: Apothic Inferno in a very well timed sponsored post. “Apothic Infeeerrrrnnnnooo” whispers my brain. “Yeeesss”. I’ll admit that Apothic has always attracted me with its dark, brooding labels. And this bottle is no exception. That styalized ‘A’ amid a background of orange and yellow flame. Apothic’s tantalizing red wine aged in whiskey barrels. It is impossible to resist. Then, my heart sinks. “Small batch limited release”. I am reminded of when I first saw an advertisement for Apothic Dark after being thoroughly impressed by the Apothic red blend. I was unable to find it in a store for months. Would I ever be able to try the “inferno”? Yesterday, I arrived home to two bottles on the counter. I said a silent prayer to the PA Wine and Spirits gods for their bounty (because, you know, there is STILL no wine at the grocery store). Believe it or not, I did not get around to drinking any wine yesterday (I know!). So here I am giving it a taste tonight. 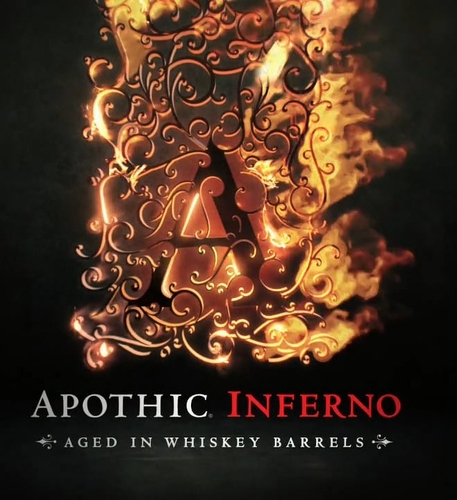 The bottle tells me that the Apothic Inferno is a dark red blend that has been aged in whiskey barrels for 60 days. The wine is very dark with a deep blackberry colored halo. It seems to have a rich, inky texture. As I have noted before, there are definitely some heavy grapes in the blend (probably petite sirah). The nose is reminiscent of other Apothic reds with pleasing candy shop notes (like chocolate covered strawberries), but there is a smokey edge to it (chocolate covered strawberries around a camp fire). The flavors hit you all at once with the first sip. More mixed candy (cocoa, dark fruit, a hint of maple sweetness) with a warm whiskey “feel” at the finish. There is just a hint of grainy tang on the end that gives the impression of sherry. The Apothic Inferno is a heavy wine, but very, very enjoyable. It would overpower most food (except perhaps something equally rich like chocolates or cheesecake). It is a good wine for enjoying by itself with some great conversation (I recommend opening it AFTER the kids are in bed). As usual for Apothic, the grapes are beautifully blended in a way that seems to be characteristic of the brand. The 60 day period in the whiskey barrels is not a long time, but obviously long enough to impart the good graces of the whiskey into the blend taking it to a new level. This wine is affordable, well made and enjoyable. I give it a 94 and you should get it while its available! I love wine and whiskey, so when I saw this on the shelf my brain said “YES. NOW.” 😉 Then I got home and thought, is this any good? Have had four bottles and thoroughly enjoyed them. Only have two left but hope to get more before discontinued. Tasted this wine tonight…thought the smoky whiskey barrel taste was a little overpowering. My wife and I prefer Robert Mondavi red blend whiskey barrel aged over this. Where can I find Robert Mondavi red blend whiskey @? I agree, it’s drinkable but the whiskey taste overwhelms it. My brother and I came across this wine about 3 months. We both enjoy a robust cabernetwine, but after buying a couple of these bottles my brother bought a case. You could easily mistaken this winefor something in the $50- $100 wine category and be easily fooled in my humble opinion. It is a seasonal wine and now I’m searching for more! This wine is total crap. What is wrong with you plebs? I don’t know – i like Apothic Red. I like the kick in the Fire one – but urgh the taste reminds me of wine + raid. I love all the apothic Collection. The inferno is the latest one I tried and i feel like it truly delivered. Forgot about the higher alcohol content and it knocked me on my a$$. This wine is so dark and heavy, and smooth to boot. Goes great with cheese or rich chocolate cake. I’m in love. Buying a case tonight. I usually hate apothic red blend wines, but the inferno is delicious! The whiskey give it depth.